A wedding is one of life's great moments, a time of solemn commitment as well as good wishes, feasting and joy. We would love to be able to host your wedding in Mitcheldean or Abenhall. Marriage is intended by God to be a creative relationship, as his blessing enables husband and wife to love and support one another in good times and in bad, and to share in the care and upbringing of children. For Christians, marriage is also an invitation to share life together in the Spirit of Jesus Christ. It is based upon a solemn, public and life long covenant between a man and a woman, declared and celebrated in the presence of God and before witnesses. The overall cost of a church wedding will vary greatly depending on your requirements but there are two fixed costs. Additionally, an Organist Fee of £75 for Mitcheldean or Abenhall is charged. Additionally, you may wish for the church bells to be rung. This can also be provided (subject to availability) at additional cost. If you would like to discuss the possibility of getting married in Mitcheldean or Abenhall, please contact Fr David. Need some ideas? 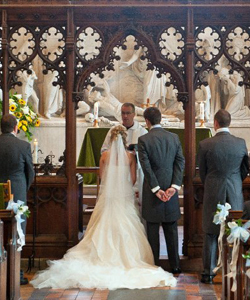 Then visit the Church of England's www.yourchurchwedding.org, where you will find help to plan a personal, meaningful, spiritual and beautiful church wedding. You are also most welcome to visit our churches and see if they will be suitable for you. Mitcheldean Church is open daily between 9am and 4pm. Abenhall is occasionally open but a key is available at the farm opposite. To ensure you can get in when you wish to, you can contact a church warden in advance. Contact us for details.